**All teams must be pre-registered to play by Sunday, July 7th, 2019. Please note registration by Sunday, June 23rd will include a free tournament t-shirt. Thank you for registering for our 7th Annual MFMS Wiffle Ball Tournament. All teams must consist of 4 players, ages 15 and above, and all team members must be registered by Sunday, July 7th to play. Entry by Sunday, June 23rd will include a free tournament t-shirt. Important Note: Please designate one person per team to register for this event. The designated team member will be required to pay the $140 team entry fee (the per player entry fee is $35.00). We appreciate you joining us and we look forward to a fun-filled day for all! Trophy awarded to top two teams and prize to winning team. Thank you for registering for our 7th Annual MFMS Wiffle Ball Tournament. All teams in the Kids Major League must consist of 4 players, ages 10-14, and be registered to play by Sunday, July 7th. Entry by Sunday, June 23rd will include a free performance t-shirt. Important Note: Please designate one person per team to register for this event. The designated team member will be required to pay the $88 team entry fee (the per player entry fee is $22.00). We appreciate you joining us and we look forward to a fun-filled day for all! Trophy awarded to top two teams and prize to winning team. Thank you for registering for our 7th Annual MFMS Wiffle Ball Tournament. All kids must be ages 6-9 to enter into the Little League bracket and be registered by Sunday, July 7tg to play. Entry by Sunday, June 23rd will include a free tournament t-shirt. We are allowing players in this league to signup as individuals or a team of 4. For individuals we will put teams together the day of the tourney. 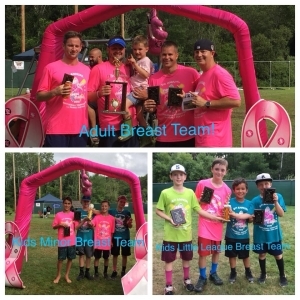 Winning team will receive a team trophy and 4 individual plaques as well as a prize. 2nd place will receive individual team medals. We are looking forward to a fun-filled day for all!